Day 1: Drive to Zululand , passing the rolling hills of sugar cane fields and forest plantations. Visit a Zulu kraal near Mtubatuba. Cultural programme of Zulu traditions : beer brewing, spear making, hut building, pottery, weaving, traditional dress, Zulu etiquette and the layout and social structure of a kraal. Singing and tribal dancing. Typical Zulu meal served in the boma. Afternoon game viewing in Hluhluwe-Umfolozi Game Reserve, renowned for its wide variety of bird and animal life including the famous white rhino. Dinner and overnight at Hilltop camp, situated high on the edge of a steep forested slope overlooking the hills of the Hluhluwe Reserve. Day 2: Full day game viewing with a picnic lunch. Dinner and overnight at the camp. 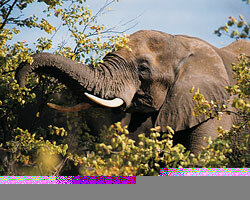 Day 3: Optional early morning game drive* After breakfast at the camp, travel to St Lucia. After lunch, boat trip on the estuary, home to Nile crocodile, hippo and an astonishing variety of birds.